Unleashing the Ideavirus. Seth Godin. Do You Zoom Inc. 224 pages. $40 (or free). You know how you encounter someone, maybe at a party or a meeting, and you hit it off immediately? There are things you have in common, but there are also things that you may not have already known, or even thought about, but get your brain buzzing. 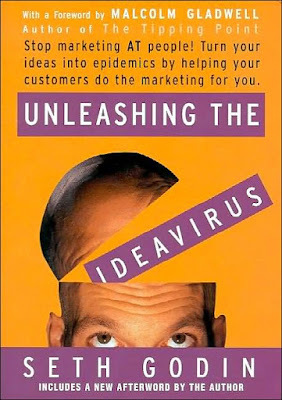 Seth Godin's new book, Unleashing the Ideavirus, is like that: friendly but stimulating and provocative. There's a ton of familiar stuff, especially for readers of customer-oriented Web marketing books like The Cluetrain Manifesto (Godin even refers to his book as a manifesto). You know the rap: The Internet has changed the way people do business; one-on-one is where it's at, people-to-people, not corporate monoliths and clients. Companies failing to capitalize on this new hierarchy will fail. Despite recent market corrections to overvalued dot-coms, there's no question that barring an alien invasion or apocalypse, online commerce is here to stay. But it's not business as usual with buyers offering capital goods and sellers seeking same. Instead, much of the commerce is in ideas. Long-term capital growth remains important, but frequently the "new, new thing'' presents opportunities for massive profits in a shorter time frame. Godin says that promoting new ideas in a noninterruptive, noninvasive "permission marketing'" manner ensures a fast embrace by early adopters, who will then spread the idea like a virus among like-minded compatriots, who will in turn do the same. The dissemination of the idea by enthused acolytes is more powerful and effective than any multimillion-dollar Super Bowl TV spot and - budget permitting - the subsequent print and broadcast ad campaign. Those are the basics. He gets into other stuff, coining appropriate jargon to describe the accompanying phenomena and its spreaders ("sneezers'') but Godin's viral marketing is, essentially, highly credible, e-mail-enabled, targeted, word-of-mouth buzz, with added specificity, interactivity - and effectiveness. So what's the big deal? Godin's résumé suggests that attention must be paid. A consultant and author, Godin is endlessly curious, opinionated and knowledgeable on a wide variety of subjects. He founded an online marketing firm, Yoyodyne, which was subsequently acquired by Yahoo!, which retained Godin as its director of direct marketing. Godin is a relentless marketer with a powerful streak of self-promoting hucksterism, but he's also a clear-eyed visionary with strong and sensible ideas on how the new economy can, should and will function. And he walks it like he talks it, advocating free downloads, la Napster, to create and stimulate interest and demand, so Unleashing the Ideavirus is available for free online. If you've got an infectiously good idea, Unleashing the Ideavirus could be worth a shot.